sushidog: Perhaps an odd recommendation, but both novels explore a (temporary) immigrant's experience in America. calvert-oak: Slowly and ruthlessly breaks down the relationship of the empire to its former subjects. baystateRA: A first-person narration over a single long conversation with loads of backstory skillfully woven in. The Reluctant Fundamentalist is a lesson in civility. Its pacing is practiced and hospitable. There is ceremony and sublimation. Such is the story of Changez, a Pakistani Princeton graduate and one-time corporate star in NYC, told on a wonderful day in Lahore. His shadowy interlocutor is an American of unknown intentions. The novel offers a modest immigrant's tale. While it is clear there is extreme emotion just under the surface, the notion of any real threat remains uncertain. It is this menace which propels the narrative, enhances our suspicions, allows to err on the side of a hasty credible threat. Very well written book, it was gripping. If you're going to read it, do not read any plot summaries, just let yourself get immersed in the relentlessly tense continuous first person narrative. The plot was a little hackneyed and predictable, but the protagonist's attitudes and experiences spoke to me. Glad it is short - I made it through but I was rather "meh" about the whole thing. Apparantly it is full of symbolism - all of which passed me by. A brave and empathetic novel that puts a spin on the traditional US-tertiary-educated immigrant experience by examining the effects of 9/11 on what would have otherwise been a successful American-dream story. It seems that Hamid would have us understand the novel's title ironically. We are prodded to question whether every critic of America in a Muslim country should be labeled a fundamentalist, or whether the term more accurately describes the capitalists of the American upper class. Yet these queries seem blunter and less interesting than the novel itself, in which the fundamentalist, and potential assassin, may be sitting on either side of the table. There's undoubtedly a great novel waiting to be written out of the anguished material of these kinds of east/west encounters. This book may not be it, but its author (who won a Betty Trask award for his first novel, Moth Smoke) certainly has the potential to write it. "Excuse me, sir, but may I be of assistance? Ah, I see I have alarmed you. Do not be frightened by my beard. I am a lover of America." "...one of my coworkers asked me a question, and when I turned to answer him, something rather strange took place. I looked at him - at his fair hair and light eyes and, most of all, his oblivious immersion in the minutiae of our work - and thought, you are so foreign. I felt in that moment much closer to the Filipino driver than to him; I felt I was play-acting when in reality I ought to be making my way home, like the people on the street outside." "Have you heard of the janissaries?" "No," I said. "They were Christian boys, he explained, "captured by the Ottomans and trained to be soldiers in a Muslim army, at that time the greatest army in the world. They were ferocious and utterly loyal: they had fought to erase their own civilizations, so they had nothing else to turn to... How old were you when you went to America?" "There really could be no doubt: I was a modern-day janissary, a servant of the American empire at a time when it was invading a country with kinship to mine and was perhaps colluding to ensure that my own country faced the threat of war. Of course I was struggling! Of course I felt torn!" "But why are you reaching into your jacket, sir? I detect a glint of metal. Given that you and I are now bound by a certain shared intimacy, I trust it is from the holder of your business cards." 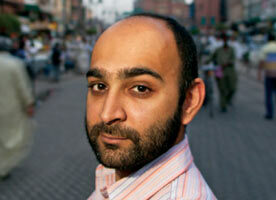 Mohsin Hamid's first novel, Moth Smoke, dealt with the confluence of personal and political themes, and his second, The Reluctant Fundamentalist, revisits that territory in the person of Changez, a young Pakistani. Told in a single monologue, the narrative never flags. Changez is by turns naive, sinister, unctuous, mildly threatening, overbearing, insulting, angry, resentful, and sad. He tells his story to a nameless, mysterious American who sits across from him at a Lahore cafe. Educated at Princeton, employed by a first-rate valuation firm, Changez was living the American dream, earning more money than he thought possible, caught up in the New York social scene and in love with a beautiful, wealthy, damaged girl. The romance is negligible; Erica is emotionally unavailable, endlessly grieving the death of her lifelong friend and boyfriend, Chris. Changez is in Manila on 9/11 and sees the towers come down on TV. He tells the American, "...I smiled. Yes, despicable as it may sound, my initial reaction was to be remarkably pleased... I was caught up in the symbolism of it all, the fact that someone had so visibly brought America to her knees..." When he returns to New York, there is a palpable change in attitudes toward him, starting right at immigration. His name and his face render him suspect. Ongoing trouble between Pakistan and India urge Changez to return home for a visit, despite his parents' advice to stay where he is. While there, he realizes that he has changed in a way that shames him. "I was struck at first by how shabby our house appeared... I was saddened to find it in such a state... This was where I came from... and it smacked of lowliness." He exorcises that feeling and once again appreciates his home for its "unmistakable personality and idiosyncratic charm." While at home, he lets his beard grow. Advised to shave it, even by his mother, he refuses. It will be his line in the sand, his statement about who he is. His company sends him to Chile for another business valuation; his mind filled with the troubles in Pakistan and the U.S. involvement with India that keeps the pressure on. His work and the money he earns have been overtaken by resentment of the United States and all it stands for.